Every fixture can be edited using the Fixture & Result Editor. 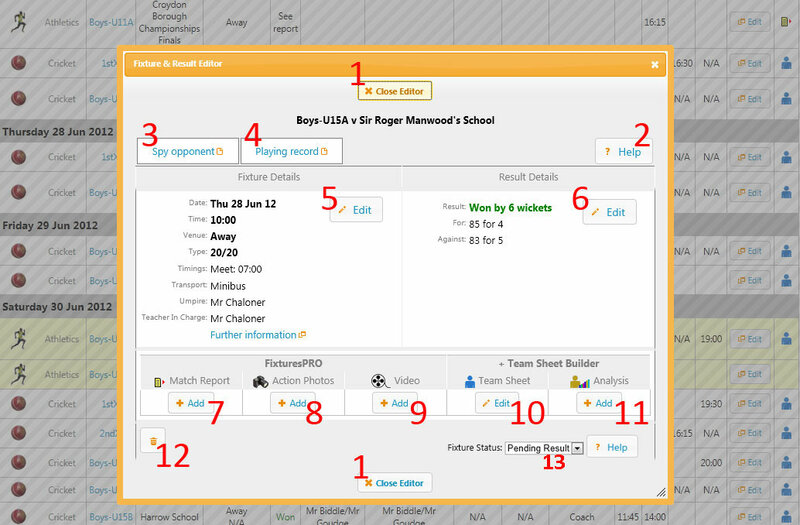 The screen shot shows the main features of the Fixture & Result Editor, with a description of each below. 3. If the fixture is against a listed opponent then you will be able to see your opponent's fixture list. 4. If you have played against your opponent previously (and fixtures and results have been uploaded) then you can see your playing record. 5. Edit the Fixture details using this button. Note: Some fixture details, such as meet and return times are only available with Team Sheet Builder. 6. Add or edit the result. SOCS recognizes the sport and will show the corresponding result editor. The results editor button is not visible until the day of the fixture. 7. The match report editor. 8. Upload action photos - 10 per fixture. 9. Upload a video clip - 1 per fixture. 10. Select players and add a Team Sheet for the fixture. 11. Confirm participation and performance - active once a fixture has taken place and if a team sheet has been added. 12. Delete a fixture button - Note:Competition fixtures associated with a competition microsite cannot be deleted. 13. When a fixture is still in the future the fixture status can be set to Postponed or Cancelled using the drop down box. Note: If the fixture has been played or was abandoned or postponed on the day, it is possible to use the Result Details Edit button (button 6) and then force the Result using the drop down list to “Postponed” or “Cancelled” or “Withdrawn” or “Abandoned” etc.